Try to convert HTML5/YouTube WebM video to MP3 audio while keeping lossless quality? Check the best solution below! WebM  is a video file format consisting of VP8/VP9 video streams and Vorbis/Opus audio streams. Based on Matroska container, WebM is developed as a high-quality and open video format for web. This video format is natively supported by various browsers (Firefox, Opera, Chrome, Windows 10 Edge), video players (VLC, 5KPlayer etc.) and Android since version 2.3. In addition, YouTube can offer WebM videos in different resolutions, 360P, 480P, 720P and 1080P HD. MP3  is the most popular audio file format at present. Using lossy data compression, it reaches a high reduction in file size (1/4 to 1/20 of CD quality digital audio). Therefore, it becomes the ideal audio format for delivery and storage. MP3 also has the highest compatibility which can be played on computer, portable devices and player software. Why Convert WebM to MP3? In many cases, people hope to extract MP3 audio from a WebM video downloaded from websites. For example, someone only want to get audio tracks from music videos, YouTube playlist, lectures, news etc. Due to low compatibility of native audio streams Vorbis/Opus of WebM, it is better to convert WebM to MP3 for a successful playback on mobiles or adding as background music for homemade videos. Well, this article will lead you to convert WebM to MP3 while keeping original quality via the best WebM to MP3 converter. What's the Best Program to Convert WebM to MP3? WinX HD Video Converter Deluxe is absolutely a video conversion expert offering a pretty simple solution helping users convert extract MP3 from WebM. Equipped with High Quality Engine, the output audio can be preserved in a high even lossless quality. Thanks to Hyper-threading tech and support of Multi-core, Hardware Encorder (Intel QSV & Nvidia CUDA/NVENC), it can convert WebM to MP3 in a flash. Apart from WebM to MP3, WinX HD Video Converter Deluxe embeds 370+ video/audio codecs to perform video conversion among almost all popular formats, such as WebM to MP4, MP4 to WebM, MP4 to MP3, MKV to MP4, MP4 to AVI and so on. And, it offers 410+ device profiles enabling users to output fully compatible videos for iPhone (7/7 Plus), iPad, Android, Windows Phone, Surface Pro/Book, Xbox, PS3/4 etc. It also acts as an online video downloader, which can free download videos from YouTube, Vimeo, Dailymotion, Vevo and other 300+ sites to WebM, MP4, FLV, 3GP with no effort at all. How to Convert WebM to MP3? First of all, DOWNLOAD and install WinX HD Video Converter Deluxe on PC (Windows 10 and lower). Mac version is available for Mac OS X Snow Leopard to macOS Sierra. This guide will show how to convert WebM to MP3 on Windows 10. Mac version shares similar workflow. Step 1. Import WebM Video. Launch WinX HD Video Converter Deluxe. Click + Video button to add the target WebM video. If you would like to convert an online HTML5/YouTube WebM video to MP3, please hit YouTube URL button. Next, a smaller window pops up. Copy and paste YouTube URL of a video to the address bar. Click Analyze to access to video info, title, duration, versions varying from resolution, format, size and code. Select desired WebM version and click OK. Tip: Auto convert option is checked by default so that the selected WebM video will be automatically added to conversion list. Uncheck "Auto convert" and the video will be downloaded without conversion. Step 2. Select MP3 as Output Format. Later, the Output Profile window appears. Select to Music option from Output Profile Category list. 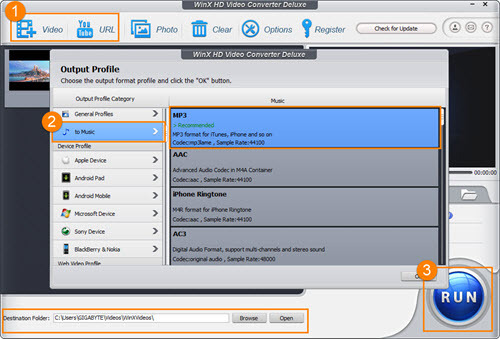 Choose MP3 and click OK. WinX HD Video Converter Deluxe also provides other popular audio formats for outputting, including AAC, AC3, FLAC, WMA, M4R and more. Step 3. Start Converting WebM to MP3. Browse to set destination folder and click RUN button to convert WebM to MP3. After the conversion is completed, you can transfer MP3 file to iPhone/iPad/iPod and make this MP3 as ringtone later via the best iOS file manager - WinX MediaTrans. ▪ Download WebM videos in SD/HD/4K/8K/3D from YouTube and convert to MP4 with no effort at all. ▪ Convert and compress HD/4K/8K WebM videos to MP3, FLAC, AAC, MP4, AVI, WMV, MOV, iPhone, iPad, Samsung, Google Nexus, Sony Xperia, Windows Phone, Surface Pro/Book, PS3/4, Xbox One/360 etc, for a better playback whenever wherever.